Under the paper sensor bracket. Use an alcohol wipe or alcohol saturated paper. You will want to make sure that all parts on the door are clear of any debris and adhesive. B. In some cases replacing the MPFeeder Door Board can fix the problem. An MP Feeder Door board can be purchased on Primera.com. 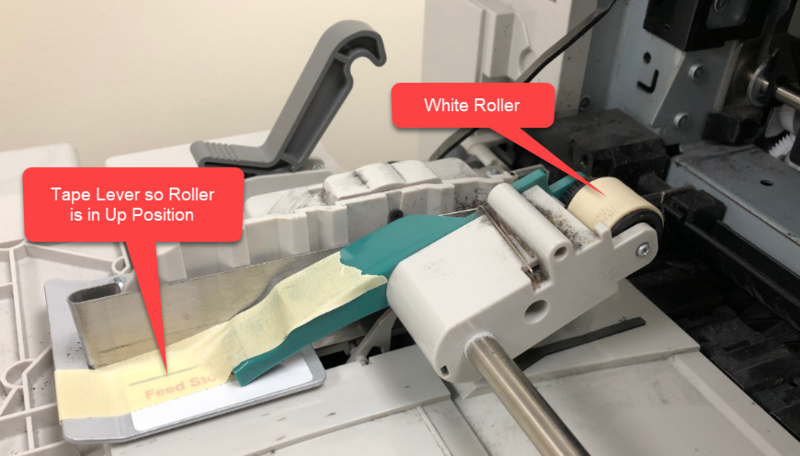 C. If after cleaning and board replacement, you still receive a paper jam error, try helping the leading edge of the paper into the printer by pushing it into the feed area as soon as you see the roller begin to turn. Sometimes the roller loses its grip over the time and is no longer capable of pushing the paper to get it started into the printer. The roller is only necessary to start the paper movement so if the printer grabs the paper the internal rollers will take over the process of feeding the paper through the printer. Push the paper all the way in until you can't push anymore. You'll get a Paper jam error. This is normal. Pull the paper back just a bit until the paper jam error disappears. Now watch and wait for the white roller (or other remaining components such as gears or shafts) to start moving. As soon as it starts moving quickly push the paper into the printer until he printer grabs the paper. If the timing was right the paper will exit the printer on the right side. Tape the paper to the rewinder as you normally would. The printer will continue to print and automatically cut at the end of the job like normal. If you receive a paper jam after the printer started accepting the paper, it just means you were too late with your push or you didn't push the paper in far enough. To reset, remove the fuser and gently pull out the printed paper. Note, the toner is not fused so be careful not to drop or jostle the paper before disposing of it. Note: This procedure requires a working MPFeeder Board and a working MP Feeder motor. It is best used in situations where the white roller itself is damaged or the surrounding gears and associated parts are broken. An MP Feeder Door board can be purchased on Primera.com. 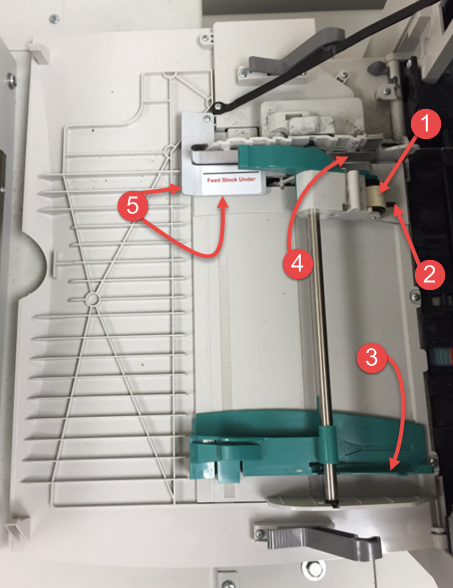 D. If you have cleaned all parts on the MP Feeder Door and you are still getting a paper jam error, you will need to send the MPFeeder Door to Primera for repair. Please contact support.